The Tao of cooking and eating — the Way to health and well-being! This film investigates the impact of religious influences on Chinese culture and cuisine. This is the second film in the classic four-part series, “A Taste of China,” which remains perhaps the best introduction for Westerners to traditional Chinese culture. At a sacred Taoist retreat, high on Blue City Mountain in Sichuan Province, a priestess marinates pickling vegetables and demonstrates how the contrasting forces of yin and yang are balanced and harmonized in food and cooking. Following a look behind the scenes of one of China’s oldest and best-known herb shops, the film visits an unusual herbal medicine restaurant where the maitre d’ “prescribes” meals according to the ailments of each diner. Visits to two monasteries illustrate the role of Buddhism in the development of China’s extensive and elaborate vegetarian cuisine. 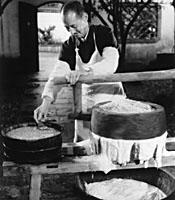 At the first, monks demonstrate the making of tofu in the time-honored way. The second monastery, Ling Ying in the city of Hangzhou, is famous both for its enormous golden Buddha and its enormously popular restaurant. Here water chestnuts are cut to resemble cooked shrimp and a fanciful vegetarian “fish” takes shape in the hands of a talented chef. Produced by Sue Yung Li. @Directed by Michael Lerner.